BROOKLYN, N.Y. (CNS) — When Pope Francis urged that the Gospel be preached at the peripheries of society, he may not have had the street artists of Bushwick in mind. But then again, Father Frank Mann is not so sure he wasn’t talking about them. In fact, Father Mann recently began a special ministry to those young artists who have been transforming that Brooklyn neighborhood into a magnet for like-minded individuals and in turn, changing the face and the faces of the area. Assigned part time to St. Martin of Tours Parish, the 64-year-old priest spends most of his time walking the streets, sipping coffee in the burgeoning cafes, or pursuing his own art in his studio that is part of an artists’ complex in what was an old factory. His door is always open and other artist-residents wander in and out to say hello, never quite sure what a priest is doing in their midst. There’s no hard sell about the Catholic Church or the faith but inevitably, matters related to spirituality and faith arise. 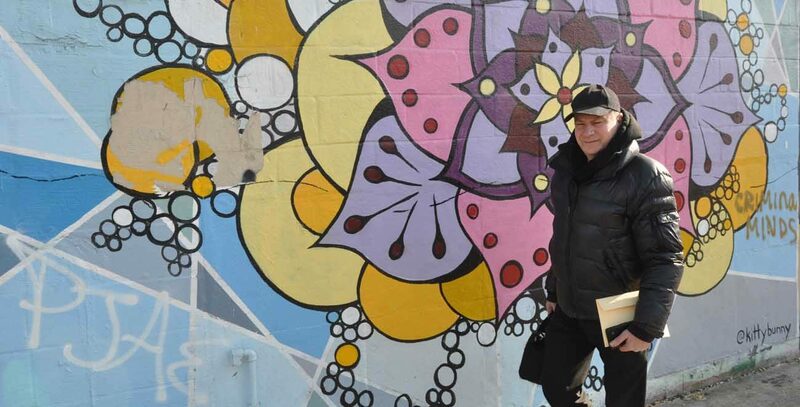 “My experience to date with many of the street artists is that they are often Roman Catholics who are rather starkly disconnected from the church and/or their parishes,” he observed. For Father Mann, it all comes quite naturally. He has an eye for art and though he has no formal training, he has taken to expressing himself in oils and watercolors on canvas. One original piece he calls “Souls in Eternity,” and another “The Beauty of Creation.” Both were recently on view at a local exhibit. “I believe that my passion for street art and the artists themselves affords me a unique approach to being present to them where they are — without being judgmental or acting with an overbearing attempt to proselytize,” he explains. “In this manner, I may have some effect on reconnecting them in some positive and uplifting way to the church as well as to a multitude of matters pertaining to that which is spiritual. On a recent Sunday morning at St. Martin of Tours Church, he was surprised when he looked out into the congregation and recognized some of the artists with whom he had chatted during the week. He also has had opportunities to offer advice and counsel people after random chats. Father Mann said he has been able to form friendships with well-known street artists such as Plasma Slug, whose tag and work adorns many outdoor brick walls. The young artist is active in the community with his own works of charity, such as hosting a dinner for the homeless on Thanksgiving. Another talented duo with whom he enjoys conversing are Icy and Sot (tags), well-known Iranian artists whose work can be viewed around the world. One short-term goal for the priest is to sponsor an art contest with a religious theme, such as works dealing with the themes of Pope Francis’ “Laudato Si'” or the recent Year of Mercy. He recently had a discussion with 14 artists on the significance of “Laudato Si’,” and encouraged them to reflect about how they can inspire others through their art to protect and respect the environment as well as all created life. “It’s important that I try to encourage and stimulate ideas and discussion regarding the many aspects of the transcendence found in our lives,” he said. Meanwhile, he continues to pursue his unique ministry while exploring the galleries in Bushwick. And he continues to hone his own skills in a studio that cries out for an appropriate name. “It has a ring to it,” said Father Mann. Wilkinson is editor of The Tablet, newspaper of the Diocese of Brooklyn.